The time has finally come for us to release our inaugural Special Edition. Earlier this year we rolled out our first W.A. Karas Signature Limited Edition pens. But during the process of working on those pens, we started to brainstorm ideas around Special Edition pieces as well. The idea was to include some other companies that had similar a similar outlook on being American “makers”. It wasn’t hard for us to decide on Nock Co. as our first partner. It also helped that they were in the works creating yet another stellar pen/notepad case. So our brainstorming began to take on a more focused approach. The stars pretty much aligned when Dan sat down and started work on designing the Karas Pen Co notebooks. As he finalized the Arizona state flag onto the notebook, we realized a great first Special Edition would take on an Arizona theme. It’s probably not a surprise to anyone that we take pride in the “Made in America” branding. 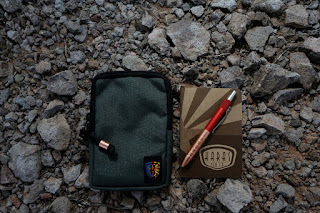 But we have always felt that “Made in Arizona” is another equally important descriptor of Karas Kustoms and Karas Pen Co. With that in mind and our new Arizona themed notebooks we set out to create an Arizona themed Special Edition. An edition that carries elements of the Copper State laid out in a manner that fits both Karas and Nock Co. The Karas Pen Co. Superstition is the culmination of all of this hard work. This special edition takes its name from the Superstition Mountains, a range of mountains that run just east of the Phoenix metropolitan area. They are anchored by Superstition Mountain itself, a large mountain that is a popular tourist and hiking spot. The Superstition Mountains are famous for their central role in the legend of the Lost Dutchman’s Gold Mine, as the mine itself is said to be hidden somewhere in the Superstition Mountains. Nock Co. has gone out of its way to name their cases after well-known Georgian land features. With that in our minds we wanted to pay tribute not only to Arizona but to them and we affectionately named our version of the case The Superstition. 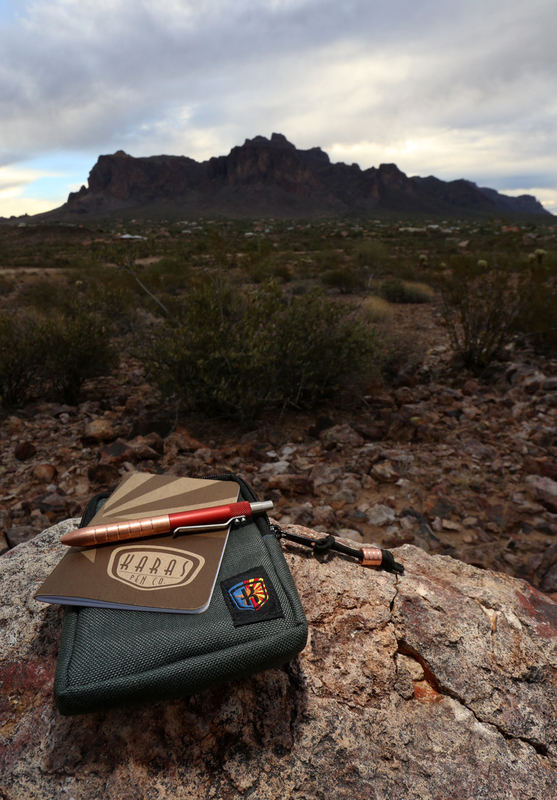 The special edition features the starting piece of this project, the Karas Pen Co Arizona State flag notebook. But we went and added some other touches of the Copper State. The Superstition has a custom Karas Pen Co logo with the Arizona State flag stitched into it. It is lined and stitched in blue that brings to mind the blue on the state flag. 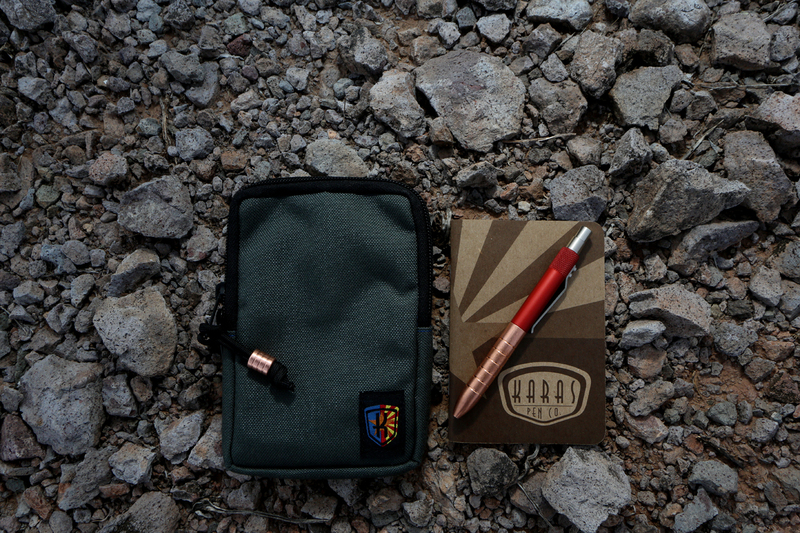 The pen included is a custom Karas Kustoms EDK, with a copper lower barrel and red upper barrel. The red is reminiscent of the red rays on the state flag. To top it off we are adding our first foray into bead making with a nice copper lanyard bead that can be used as a zipper pull. The case is one of our personal favorites. It is designed to hold three pens and two pocket sized notebooks or a stack of 3x5 notecards. It can also be slightly expanded to hold two additional pens, though it’s not specifically designed for that. I have also successfully carried my cell phone in it. It’s a pretty versatile small case perfect for carrying around a few pens and some paper. Keep your eyes glued to our blog and Instagram accounts for the official release date of the Karas Pen Co Superstition special edition. This special edition is a limited run of 120 sets. Once these sets are sold we will not be doing another run. Awesome looking set. Can't wait to get my hands on one. You guys are so awesome. The only reason I hold on to my iPhone 5 is because if your badass phone protector. oo! any pictures of the new black grip section on the INK 2.0? Hello Karas Kustoms! PLEASE make "Special Edition, Superstitions Shadow" or whatever you 'd like to name it, but PLEASE make that super pen, notebook and case available again. It is so cool! I am a newbie to your products, as I just jumped over from Goulet Pens' video rollout of 2 KK Pens on their site. You do clean, beautiful work! He mentioned you made other pens / items too; I just HAD to see! Glad to hear you're in Mesa, AZ - go USA made products!! I'm certain I'll be a loyal customer starting very soon. Best to you!